EOS Worldwide continues to expand its international presence, and we couldn’t be more thrilled! We’re passionate about the Entrepreneurial Operating System® and we get excited about anything that helps companies enjoy the EOS Life™. So the latest news has us bumping fists and high-fiving, because it will take EOS® to an enormous, new audience. 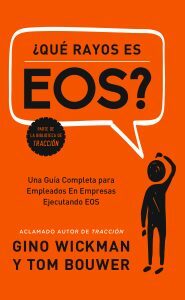 On October 9, two foundational EOS books in the Traction Library were released in Spanish: Traction and What the Heck Is EOS? Or, in Spanish, Tracción: Obtén Control De Tu Negocio and ¿Qué Rayos Es EOS? This development will introduce the Entrepreneurial Operating System to entirely new audiences, within the U.S. and around the world. There are 437 million native Spanish speakers in the world, second only to Chinese—and there are more native Spanish speakers in the United States than in Spain. These Spanish translations will help thousands more companies gain Traction® and achieve the EOS Life™. 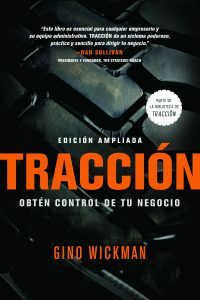 Traccion, by EOS founder Gino Wickman, is the classic business book that introduces the Entrepreneurial Operating System. The book reveals the secrets of strengthening the Six Key Components™ of your business, and it outlines the EOS Foundational Tools. ¿Qué Rayos Es EOS? is the newest book in the Traction Library. Co-written by Gino Wickman and Tom Bouwer, it is designed to introduce employees at every level to the EOS Process™ and tools. What the Heck is EOS? helps employees to understand EOS and take an active role in helping achieve their company’s vision. Together, these books lay the groundwork for organizations to begin the EOS journey. For thousands of bilingual companies and international organizations, implementing EOS at every level will now be more plausible. As Spanish-speaking businesses discover EOS, Traction Tools is already equipped to be their EOS software of choice. Our multilingual Client Success Team provides training and support in Spanish. We’re available at a moment’s notice to help companies get onboarded with the software, so they can run efficient Level 10 Meetings™ from Day One. Spanish translations of Traction and What the Heck Is EOS? are available now at the Traction Library. Check back often, and watch for Spanish translations of other EOS materials in the future. *Welcome to Traction Tools, we are excited to help you achieve success in your business! You will love the features that Traction Tools offers to optimize the use of your time without sacrificing the quality of your work. Give yourself the opportunity to explore this organized digital solution that will help you keep track of your meetings’ agenda and all the EOS tools.